Kasuri Methi is dried fenugreek leaves, a special variety from Nagaur in Rajasthan. The flavor and strength in this particular variety are world famous, as great taste enhancer and health improver. 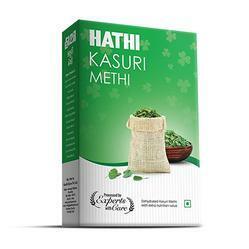 We are instrumental in offering premium quality Kasuri Methi Masala to our prestigious clients. It is extensively used in preparation of Indian dishes and taste similar to combination of fennel and celery with a slightly bitter taste. 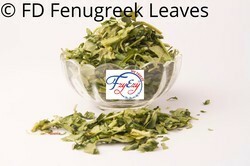 These dried fenugreek leaves add a unique flavor and aroma to the cuisines. We offer varied condiments range of Nagauri methi which is mainly used in preparation of popular and exclusive dishes for specific cuisines, we offer these methi powder at economical rates. With the bitter taste that resembles a combination of celery and fennel, the powder has a pungent odor.